It seems like bone broth is all the rage these days with people in the nutrition-know—and for good reason, we love it too. Bone broth is a superfood chock full of an array of brain-boosting vitamins and minerals for next to no calories (not that we’re counting, but some people want to know) and while it cooks for some time, the prep time is next to none—making it a really smart functional food to get in the habit of making, because it’s easy! Maybe you are already a fan of bone broth, but chances are you’re not thinking of it as something you can enjoy when the temperature gets cranked up over Summer. But what if it was made into something that most people love to enjoy year round: candy?! While I grew up eating gummy candies (so self-admittedly struggle with the nostalgia aspect) my disapproval of the brain-draining sugar and artificial flavours and colours in the conventional kinds help me refrain from eating them. 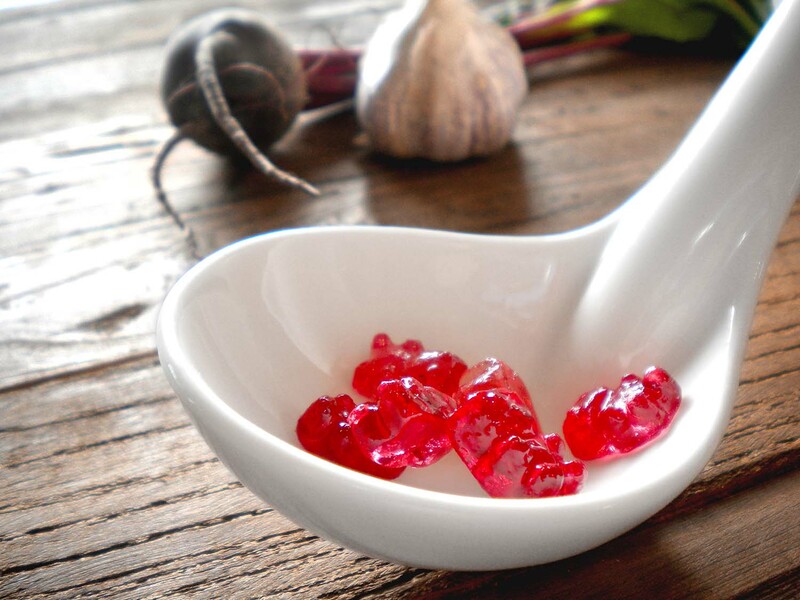 A deliciously sweet tasting, pretty gummy candy made out of brain health-promoting bone broth, however, is just what this neuro-nutritionist ordered! 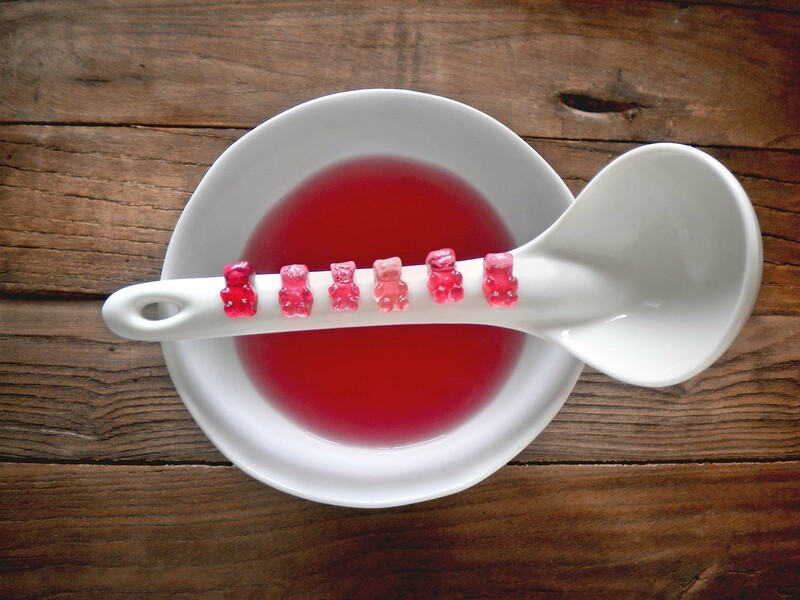 Our gummy bears (you can use any shape mold that you like, I am on the search for little brain ones) are made by combining our brain-friendly homemade Garlic Turmeric Bone Broth with grass fed gelatin (or collagen). Gelatin is a wonderful gut healer so, given our gut is becoming known as our second brain, these gummies are a real treat for your brain that you and your family can enjoy all year round. Measure 6 tablespoons of cold bone broth into a small bowl, and sprinkle gelatin on top. Stir together and allow this mixture to bloom for about 5 min. Put remaining bone broth into a medium saucepan over medium high heat, bring to boil, reduce to a low simmer and then remove from heat. Incorporate bloomed gelatin into the warmed bone broth with a whisk. Stir until fully dissolved. Pour mixture into a 9X12 rectangle dish, or whatever mold you would like to use, and place in the refrigerator for at least 3-4 hours. Cut into whatever shape you desire, or unmold, and enjoy! We used a gummy bear mold to mimic traditional gummy bears. Any leftovers you have can be stored in the refrigerator for about 5 days.